"Simple and delicious, this cream-cheese-based dip calls for a bit of milk for a smoother consistency. The longer it's refrigerated, the stronger the green onion flavor. 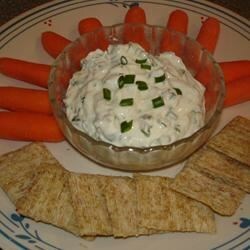 This dip goes great with chips or veggies." In a medium bowl, blend cream cheese and milk. Use more milk as needed to obtain desired consistency. Stir in green onions and salt. Refrigerate until serving. See how to make a creamy potato salad that’s almost entirely fat-free. Very good and very easy. I used garlic salt instead of regular salt for extra flavor. Awesome! I added fresh dill and whirled it all in the food processor. No salt needed. I have made this for years, via my mother's recipe. I add a few shots worcestershire sauce (Lea & Perrin) and some garlic powder to taste. It goes great with wavy chips!! !